A very popular topic around EntreArchitect is the role of the architect in the construction phase. The number of firms providing architecture services and forfeiting Construction Administration is surprising. 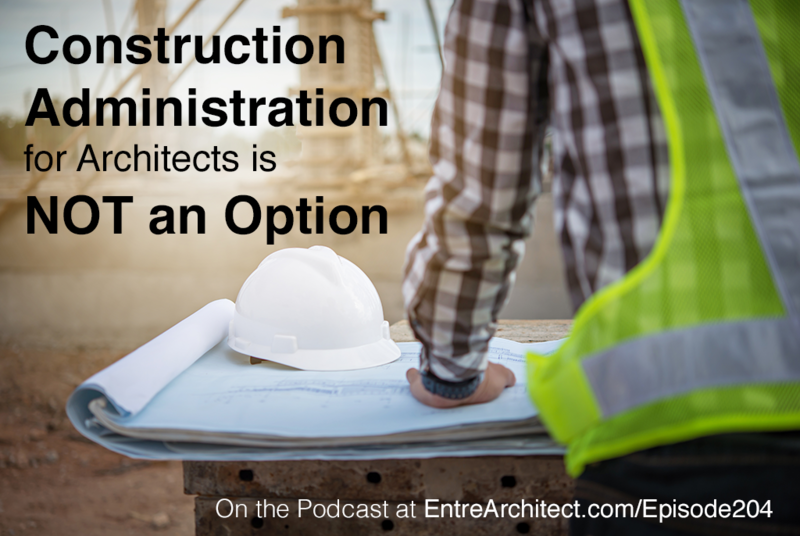 This week at EntreArchitect Podcast, Construction Administration for Architects is NOT an Option. During the past few years, we’ve began to discuss, as a profession, taking back the process. The goal is to be viewed once again as the leaders of the construction industry. To make this happen, we must literally take control of our projects and lead the process from beginning to end. 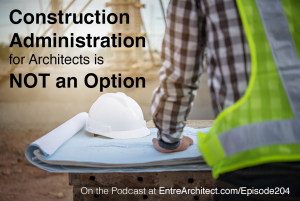 Construction Administration is not an option to be offered as an additional service, it’s an integral part of the architecture process. Do you need to get better at selling your clients on construction administration? Imagine a surgeon preparing for surgery and then handing it over to someone else to execute, or a lawyer spending months preparing a prosecution and then heading back to the office to prepare for a new case before the trial is over. It’s no different for architects. We spend months preparing a design, we work our way through three levels of increasingly difficult development and documenting exactly how a structure is to be built. How can we give it away? We’re responsible for the health, safety and welfare for the creations we make and we’re legally liable for what’s constructed from our designs. It’s our responsibility as licensed professionals to observe the construction of our designs and confirm that they are being built as we designed them. Fivecat Studio Architecture provides Construction Administration on every project from a storage shed to a completely new construction. We’re a full-service architecture firm. We help our clients organize from their first ideas of the projects all the way through the end of construction. Most clients have no idea how our process actually works, and yours don’t either. If you offer a service as optional, a client will look at it as such. Fivecat Studio proposes one fee that includes Construction Administration as a part of the overall service. If a client asks if they’ll work without construction administration, Mark and Annmarie let them know it isn’t an option for them. We lead weekly project meetings and review the progress of construction.We’re there to monitor things and support them in answering questions throughout the process. We confirm that the contractor is executing the project as per the design and specifications.Our client just went through a whole process that involved a lot of time and money, so they want the project done the correct way. We’re available to quickly resolve unforeseen issues and unexpected conditions so construction progress isn’t delayed.Time = money, and, in our clients’ mind, having an experienced professional to walk through that process and keep things on track during inevitable crisis is invaluable. 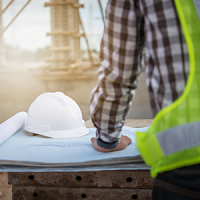 We review the contractor’s payments so we can have more leverage during construction.This allows us to protect the clients’ interest and confirm that they’re only paying for what’s appropriate at that stage of the project. Now the client feels confident that what they’re paying is accurate. We review shop drawings and submittals.We make sure they’re what the owner has payed for and help the contractor resolve any issues that may arise. We assist with preparing and confirming the completion of the punch list and that the certificate of occupancy is issued. We’re there to review and assure that everything is taken care of. We are legally responsible for the health, safety and welfare of the users of the buildings we design.We confirm that all the building and environmental codes are being observed. As licensed professionals, it’s our firm’s policy to be involved in the construction of every project. Ultimately, we need to protect our firm’s legal exposure in terms of liability. If you want to work with us, we have to be involved in Construction Administration. The success of our firm depends on this. When we waive Construction Administration, we lose our ability to resolve issues quickly and may create bigger problems for ourselves. We’re ultimately working for our clients’ satisfaction, and, if we’re absent during construction, it’s really hard to manage expectations and keep our clients happy. The experience during construction is what clients will remember most when others ask for their referral. The success of your firm depends on your involvement every step of the way. Access Mark’s fully customizable Owner/Architect Agreement at EntreArchitect.com/hybrid.